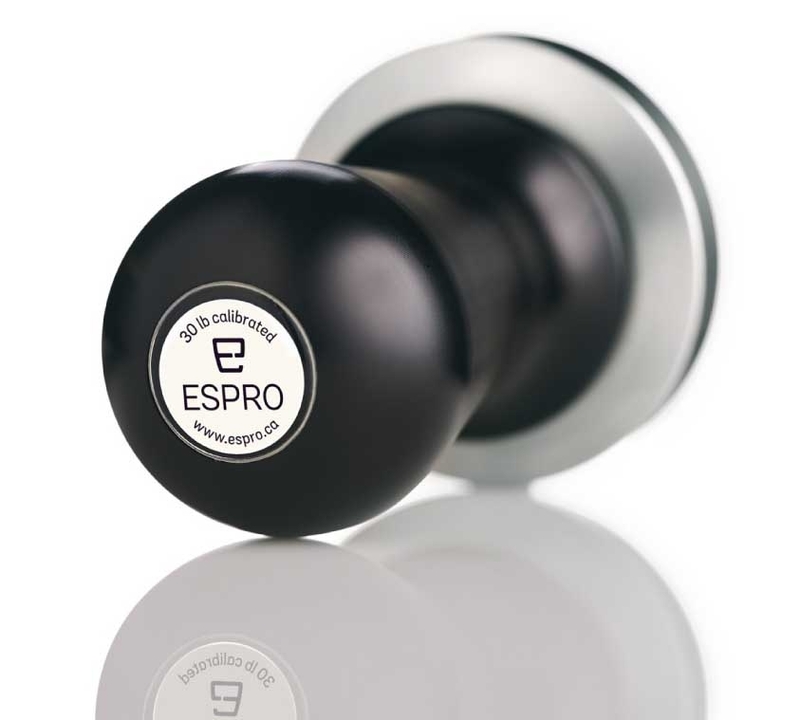 Eliminate one last variable in your espresso regime with the Espro Calibrated Tamper. Get a thirty pound tamp, every time, with this professional-quality espresso tool. This click tamper is available with either a 58mm or 53mm stainless steel base. Espresso is all about variables.. First recognizing them and then eliminating them. We all deal with grind and dose, temperature and brew pressure, roast level and freshness, and so much more. Tamping force is often overlooked and becomes the last variable. Sure, you can get the scale from the bath and test your strength, but that is not a permanent nor sanitary solution. 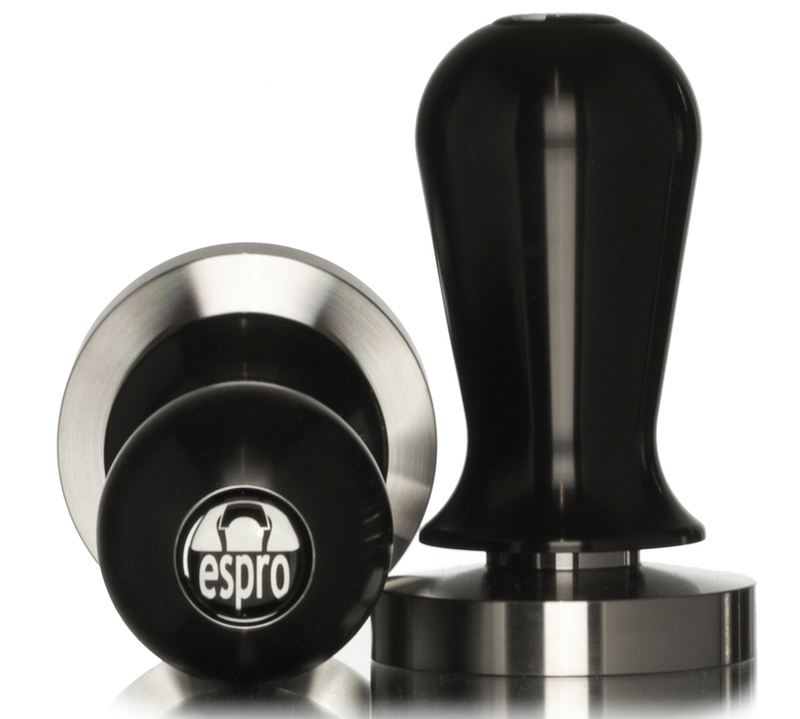 The Espro Calibrated Tamper is a precision tool that will give you a 30 pound tamping force every time. If you used a tamper before, you already know how to use the Espro Calibrated Tamper. • Press down until you feel the internal mechanism “release” signaling that you have reached 30 pounds. • Lift tamper out of the portafilter. That's right. It feels and works just like a “regular” tamper, but gives a tactile feedback the moment you reach thirty pounds of tamping force. The heavy stainless steel base and the shape of the gloss black finished handle give the tamer a heft and makes it easy to keep stable when tamping. 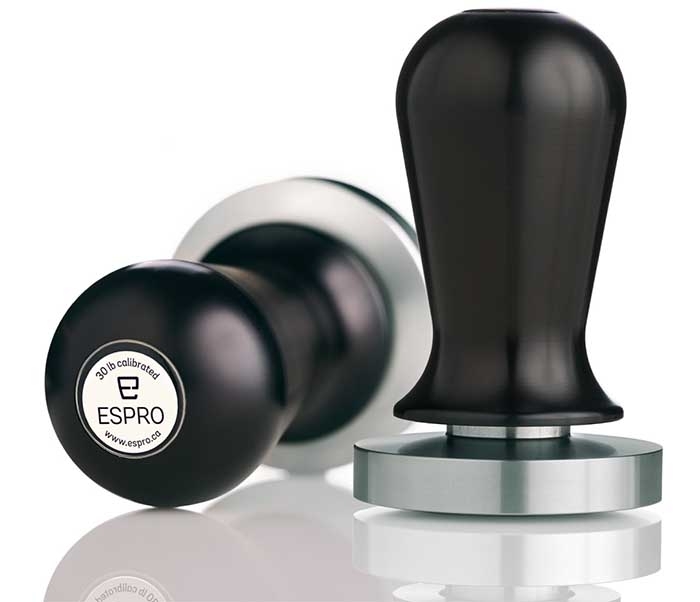 The Espro Calibrated Tamper has a one year warranty and will last years even under the heaviest of commercial use. What if something happens after that? If it is dropped? A part breaks? The tamper can be rebuilt buy the folks who built it. Espro is located in Canada and their service and support staff are there to help. We carry the 58mm & 53mm flat base models. If you have been using the plastic tamper that came with your machine or some lightweight aluminum tamper, isn't it time you moved up to a professional quality tool? Perfected the process, well worth the investment.